Two of the sky’s more famous residents share the stage with a lesser-known neighbour in this enormous new three gigapixel image from ESO’s VLT Survey Telescope (VST). On the right lies the faint, glowing cloud of gas called Sharpless 2-54, the iconic Eagle Nebula is in the centre, and the Omega Nebula to the left. This cosmic trio makes up just a portion of a vast complex of gas and dust within which new stars are springing to life and illuminating their surroundings. Sharpless 2-54 and the Eagle and Omega Nebulae are located roughly 7000 light-years away — the first two fall within the constellation of Serpens (The Serpent), while the latter lies within Sagittarius (The Archer). This region of the Milky Way houses a huge cloud of star-making material. The three nebulae indicate where regions of this cloud have clumped together and collapsed to form new stars; the energetic light from these stellar newborns has caused ambient gas to emit light of its own, which takes on the pinkish hue characteristic of areas rich in hydrogen. Two of the objects in this image were discovered in a similar way. Astronomers first spotted bright star clusters in both Sharpless 2-54 and the Eagle Nebula, later identifying the vast, comparatively faint gas clouds swaddling the clusters. In the case of Sharpless 2-54, British astronomer William Herschel initially noticed its beaming star cluster in 1784. That cluster, catalogued as NGC 6604, appears in this image on the object’s left side. The associated very dim gas cloud remained unknown until the 1950s, when American astronomer Stewart Sharpless spotted it on photographs from the National Geographic Society–Palomar Observatory Sky Survey. The Eagle Nebula did not have to wait so long for its full glory to be appreciated. Swiss astronomer Philippe Loys de Chéseaux first discovered its bright star cluster, NGC 6611, in 1745 or 1746. A couple of decades later, French astronomer Charles Messier observed this patch of sky and also documented the nebulosity present there, recording the object as Messier 16 in his influential catalogue. As for the Omega Nebula, de Chéseaux did manage to observe its more prominent glow and duly noted it as a nebula in 1745. However, because the Swiss astronomer’s catalogue never achieved wider renown, Messier’s re-discovery of the Omega Nebula in 1764 led to its becoming Messier 17, the seventeenth object in the Frenchman’s popular compendium. The observations from which this image was created were taken with ESO’s VLT Survey Telescope (VST), located at ESO’s Paranal Observatory in Chile. 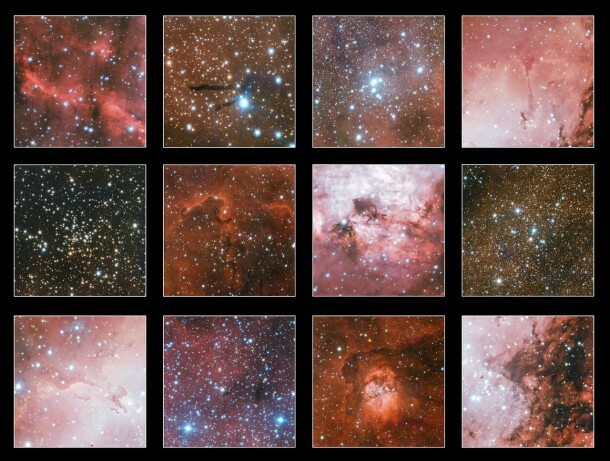 The huge final colour image was created by mosaicing dozens of pictures — each of 256 megapixels — from the telescope’s large-format OmegaCAM camera. The final result, which needed lengthy processing, totals 3.3 gigapixels, one of the largest images ever released by ESO.